Editor’s note: This article is by Jerry Chow, manager of Experimental Quantum Computing at IBM Research. Quantum computers promise to open up new capabilities in the fields of decryption and simulation not possible in today’s computers. And when made a reality, the performance improvement will be due to their fundamental unit of information: a qubit. Qubits are two-level systems that obey the laws of quantum mechanics. Imagine emulating a quantum computer using today’s approaches to building the largest computer systems in the world. If a quantum computer could be built with just 50 qubits, there is not a combination of today’s Top500 supercomputers that could successfully emulate it. The holy grail of quantum applications is to perform tasks like large number factorization and simulation of complex quantum systems, problems which are intractable with today’s supercomputers. But like today’s machines, quantum computers suffer from errors, and, worse, these errors seem to be fundamental, since quantum information is so fragile. Our team at the Thomas J Watson Research Center published results in the paper Implementing a strand of a scalable fault-tolerant quantum computing fabric (doi: 10.1038/ncomms5015) in Nature Communications (1) about recent experimental steps toward a “surface code” that shows promise for correcting these errors – and bringing fault-tolerant quantum computers a step closer to reality. The classical equivalent of a qubit is the digital bit, the “1” and “0” ubiquitous in all modern computers. Qubits, though, can exist in some combination of 0 and 1 simultaneously, a different state altogether that is called a “superposition.” When qubits interact with each other, they can form a special kind of superposition that is called entanglement. Entangled states exhibit perfect correlation no matter how far the qubits are separated in space, and this may be one of the phenomena that grant quantum computing its power. Entanglement is necessary for quantum computing, but can also lead to errors when it occurs between the quantum computer and the environment (i.e. anything that is not the computer itself). Quantum effects disappear when the system entangles too strongly to the external world, which makes quantum states very fragile. Yet, there is a kind of tension, since the quantum computer must be coupled to the external world so the user can run programs on it and read the output from those programs. This need to couple the quantum computer to its environment sets a limit to how well the system can maintain its quantum behavior. And as it interacts more strongly with the world, errors are introduced in the computation. How long a qubit retains its quantum properties is referred to as the coherence time and is a common metric to benchmark the quality of a qubit. The art therefore lies in building quantum systems with reduced errors and long coherence times. In order to build a fully-functional, large-scale, universal, fault-tolerant quantum computer, we will need to figure out how to have long coherence times and deal with errors which may arise from the manipulation of the quantum computer. The path forward is via quantum error correction (QEC), a robust theory which has been developed from the ideas of classical error correction in order to deal with errors in qubits. In classical error correction, a bit (taking values 0 or 1) is encoded into multiple physical bits. For example, three physical bits, 000, can encode the logical bit value of 0. If any one of the physical bits happens to flip its state because an error has occurred (001), the original logical value (0) can still be recovered by “majority voting” (two “00s” overrule the “1”). Encoding qubits are substantially more challenging than a bit. For one, they can’t be cloned, so we cannot simply copy to an analogous “000” bit state. We also can’t “see” the quantum information in the same way because looking at or measuring the qubit, which could be in any superposition of “0” or “1”, forces the state to choose either “0” or “1”. But it turns out that all of these problems can be overcome by the clever use of entanglement and superposition. hrough the accumulation of this parity information from the register, it is then possible to detect and locate a single error in the qubit register. But to make a fully-fledged quantum computer work, we need codes that protect against a continuum of errors on multiple qubits. Our team is focused on surface code. It has a high error threshold and only nearest-neighbor parity checks. This means that error rates do not need to be excessively low to see the benefits of coding, and each operation we need to do only involves a few physically adjacent qubits. This makes the surface code an attractive option for an experimental demonstration with superconducting qubits. We have been exploring superconducting qubits to build a universal quantum computer based on the surface code architecture for quantum error correction. 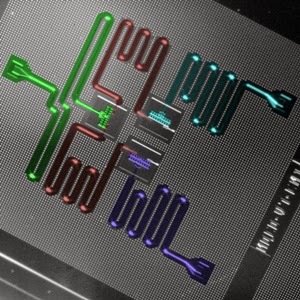 Because their properties can be designed and manufactured using standard silicon fabrication techniques, we anticipate that once a handful of superconducting qubits can be manufactured reliably and repeatedly, and controlled with low error rates, there will be no fundamental obstacle to scaling up to thousands of qubits and beyond. Coherence times for superconducting qubits have been increasing steadily for the past 10-15 years, and in 2010, those values, together with the ability to couple and control multiple qubits with low error rates, reached a point where we could start to consider potentially scalable architectures. In our newest paper, we combined a number of state-of-the-art advances within superconducting qubits in order to demonstrate a crucial stepping stone towards the surface code quantum error correction architecture. Using a three superconducting qubit network, we successfully detected the parity of two “code” qubits via the measurement of a third “syndrome” qubit (the “error detection” qubit). A larger surface code system would involve similar parity checks as we have demonstrated in this reduced system. Our result and recent findings on high accuracy controls from UC Santa Barbara show the promise for superconducting qubits. The architectural and engineering challenges that lay ahead are ripe to be addressed to get towards a fault-tolerant quantum computer.